In an alternate reality, the city of Tokyo is the battleground between humans and vampire-like creatures called ghouls, whose primary source of nutrients come from consuming humans. Ken Kaneki is a freshman in college, and hopelessly obsessed with reading books. One girl named Rize Kamishiro who has similar interests catches his eye, but he soon discovers that not all is as it seems. It turns out that Rize is a ghoul, and as they walk through an alleyway together she attacks Kaneki, but fortunately for him, at the last second debris from the contruction site collapses on Rize and kills her instantly. When brought to the hospital, Kaneki undergoes surgery and receives organ donations from the only available resource: Rize’s body. When he recovers, he quickly discovers that his body is changing, and he develops an insatiable desire for human flesh. Fans of seinen action series erring towards the more gruesome will definitely find appeal in Tokyo Ghoul. Tokyo Ghoul’s first volume delivered on a genre promise that I feel often is forgotten by horror manga: it actually has a significant horror aspect in its storytelling. From the very first chapter all the way through the duration of the first volume, the series had a relatively consistent amount of gruesome and terrifying scenes. The concept behind the ‘ghouls’ was a huge aid in this respect. Ghouls appear to be humans, but have a great hunger for human flesh, and their physical strength is aided by a terrifying predatory organ called the kagune that essentially stretches out like sharp tentacles (as well as other shapes) to kill their prey. Utilizing this concept of horror, the author Sui Ishida draws scenes in dark alleyways and similar dangerous locations in Tokyo where ghouls hunt. The drawing style during these scenes is particularly effective as the facial contortions and violent action panels are drawn magnificently and highlight the desired effects, rendering these moments as horrifically as possible. I was taken aback by how wonderfully the tone of the manga managed to shift when it needed to, especially considering the fact that it is all in grey-scale. A really interesting thing I noticed is that if you close the volume and look at the pages, you can see a white section followed by black followed by white for the first half while the second half of the volume is a mixture of the two. The reason for this is because the sections before the initial ghoul attack and during Kaneki’s realization of what he has become are much lighter than the rest of the volume when he is in ‘the world’ of the ghouls. It was little stylistic effects like this that really made the tone of the narrative mesh well with the story. As fantastic as it is that the manga has such a great amount of suspense, the real strength in this first volume that puts it above the first for many other similar series is how it manages to be entertaining while still setting up the for the rest of the story. The world, or rather both worlds, of Tokyo Ghoul are fascinating, and they are both able to be explored simultaneously because the protagonist Ken Kaneki is forceably a member of both of them. Many other vampire stories might clearly set up the ‘vampires’ of the story as the villains, but in Tokyo Ghoul, this is hardly the case. After all, to make the claim that something is evil merely for existing seems unreasonable, and ghouls have to consume humans to be able to survive. While this is only beginning to be explored, the story sets up excellently for the collision of these two worlds as Kaneki will inevitably face conflicts for being a part of both of them. Tokyo Ghoul’s first volume is an excellent setup for a story. Although there is very little of significant merit to complain about, it is worth mentioning that this volume is setup, and the primary story has yet to begin. If you aren’t interested in just reading the start, then maybe hold out for a small amount of time until the second volume comes out next week. Tokyo Ghoul is an excellent start to a series. The horror elements of the volume seem to be particularly strong thus far, with illustrations that perfectly accent the mood Ishida wants his readers to feel. By setting up Kaneki as a member of two worlds, we can already see the beginnings of a struggle that will play out between two sides without one being definitely ‘evil’, and this builds suspense in the sense that readers, including myself, will want to know what exactly will happen next. Tokyo Ghoul began serializing in Shueisha’s Weekly Young Jump imprint in September of 2011 and concluded at the same time in 2014. 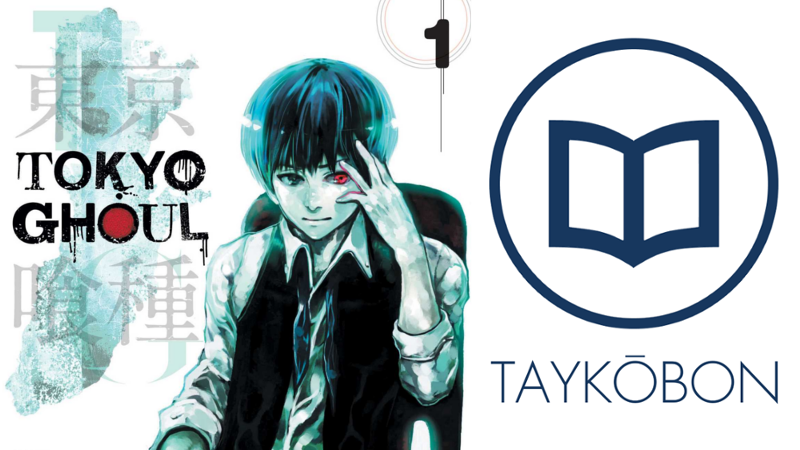 A sequel manga named Tokyo Ghoul Re: is currently being serialized, and the original manga received an adaptation by Studio Pierrot in Summer 2014 and a second season in Winter 2015. VIZ Media publishes Tokyo Ghoul in North America, and released the first volume on June 6th 2015 with a planned release of the second volume in English on August 18th.